For all the good technology offers, it’s also an addiction. I see in my own life how hard it is to stay away from my laptop, and for the sake of my family and my sanity, I’m still hanging on to my “dumb” phone. Even so, my mind is always buzzing with tasks I need to do online–until the quiet of Shabbos, when turning off the gadgets, somehow quiets the static in my head. There remains, however, one vice on Shabbos that is a struggle for nearly everyone: overeating. For one day a week, we fill our homes and our synagogues with delicacies, making it a struggle for every person not to stuff his face. 2. One cookie and one piece of candy from shul: Especially when there’s a bar mitzvah, shul can be a junk food fest. This rule keeps my kids sane, while keeping them hungry for lunch. If they somehow manage to squirrel away an extra candy, we save it for the third meal. 3. Eat a light lunch: Our lunches are almost entirely salad. We start with a cold soup or fish and then eat dishes like: udon noodle salad (recipe to come later this week), thai cabbage slaw, salsa and chips, big ol’ green salad, wheat berry salad, summer bean salad (see below) and vegan pizza. We often have baked schnitzel too, and one pound of chicken breast feeds the whole table–even up to 12. 4. 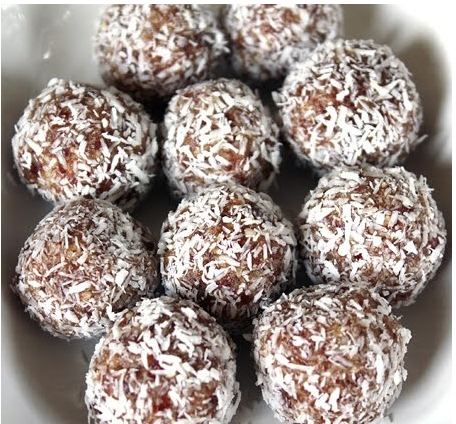 Make a healthy dessert: A dessert like banana cocoa ice cream or date balls (see below) keeps me away from the brownies, cakes and cookies. 5. Snack on popcorn: Shabbos parties, featuring a whole plate or bag of treats, are gross. My kids used to beg for it, but enough “no’s” means they’ve gotten used to not having it. Do you think the date ball recipe would work with dried dates and some water? If so, how much water? i always use dried medjool dates. I never had to add water because the dates are already moist. I think if you have really dry dates, you could soak them in some hot water, but I never tried it.